Camp Malakole (originally called Honouliuli Military reservation) was an anti-aircraft and anti-tank artillery training facility … later, Kalaeloa’s Chevron fuel refinery took over the site; just down the road is HECO’s oil-burning 651-Megawatt Kahe Power Plant. On March 22, 1939, the North Shore’s Kawailoa military firing point was relocated to Honouliuli Military Reservation, on over 1,700-acres situated between Barbers Point and Nanakuli, Oʻahu; it then served as a Hawaiian Separate Coast Artillery Brigade. Firing positions were prepared for six batteries along the shoreline and plans were prepared to add an additional three positions, allowing three battalions to conduct firing practice at the same time. The installation initially consisted of a tent camp on the southern half of the tract; officers were quartered on the east side with their mess, showers, and latrines. The post kitchen and bakery tents were located across the roadway from the officer’s encampment. Closer to the beach were the ammunition storage tents. The camp’s primary observation station was located to the rear of the firing line atop a steel-frame tower. The 251st Coast Artillery (AA,) California National Guard, was sent to Hawaiʻi in November 1940 and stationed at Honouliuli Military Reservation. (army-mil) The facility’s peacetime strength was 1,200-men and the wartime strength was 1,800-men. As a result of the flooding, a large sand berm was built between the firing line and the beach that ran parallel to the beach. With the 251st arrival came the plan to build more permanent facilities. The regiment lived under canvas pending completion of their new quarters, which they were tasked to build under the supervision of engineers from Schofield Barracks. Upon completion in early 1941, the camp consisted of temporary theater of operations-type structures. There were 48 barracks structures (90 feet by 24 feet,) 12 mess halls, 9 magazines and storehouses, 5 officers quarters, 7 showers (equipped with only cold water) and latrines. Other improvements included a dispensary, officers’ mess, headquarters building, post office, regimental day room, movie theater, laundry, motor repair shop, gasoline station, fire house, guard house, photo laboratory, quartermaster and engineers’ buildings. The majority of the buildings were built on piers with the footings buried in the coral ground. With the improvements, on January 9, 1941, the facility’s name was changed to Camp Malakole. (Bennett) It was part of the growing presence in the Islands. Back in 1941, the Hawaiian Department was the Army’s largest overseas department. For more than three decades the War Department had constructed elaborate coastal defenses on Oahu. The Hawaiian Department’s two main tasks were to protect the Pacific Fleet from sabotage and defeat any invasion. Besides carrying out extensive training (firing exercises, field maneuvers and gas attack drills,) several members of Camp Malakole participated in sports activities and entered the Hawaiian Department track meet on May 29, 1941, winning several first places and some second and third places. Then, like other military installations in the Islands, things changed with the Japanese attack on Pearl Harbor on December 7, 1941. They were about two miles offshore at an altitude of between 500 and 800 feet, headed toward Camp Malakole. (Harding) They were out over the water just as the Japanese attacked. They were shot down. (Kelley) Guards at Camp Malakole shot down a strafing Japanese plane at about 8:05 am with small arms fire. Newly arrived coast artillery units on Oahu in 1942 were quartered at the camp during the early months of the war. Later in the war, the Hawaiian Antiaircraft Artillery Command (HAAC) took over operation of the camp, which was used completely as the principal facility for training antiaircraft units on Oʻahu during the war. 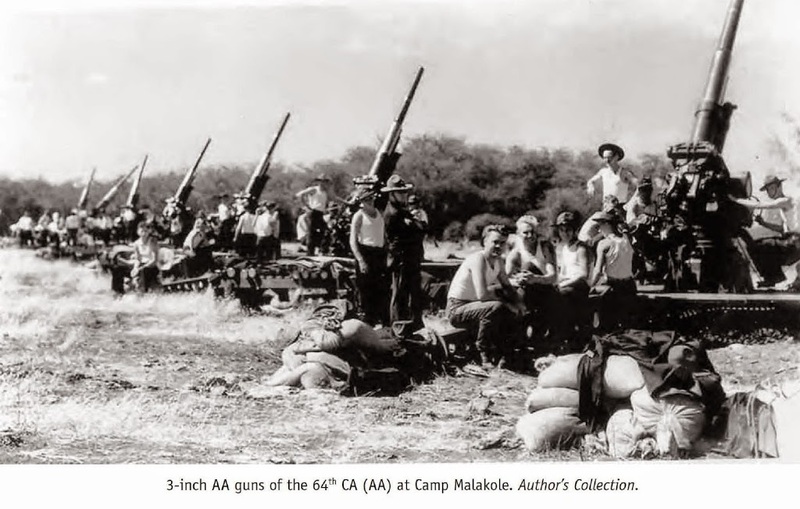 The image shows 3-inch guns at Camp Malakole. (Bennett) In addition, I have added other images to a folder of like name in the Photos section on my Facebook and Google+ pages.